Mail in Registration open for a few more days! Online registration starts April 20th, but there’s still a few more days for our early bird option! Mail-in closes April 15th. The 6th Annual DC Zinefest will be held on Saturday, July 23rd from 11-5 at St. Stephen’s Church (1525 Newton St NW). 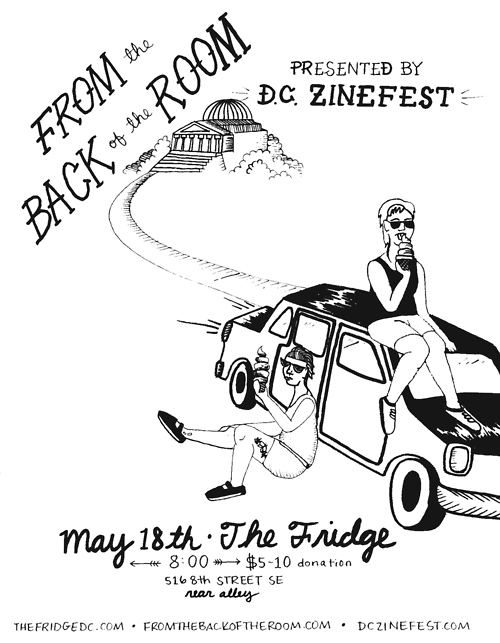 DC Zinefest is always FREE to attend, accessible, and open to the public. Tabler registration information is coming soon! Tablers are up + Upcoming events! 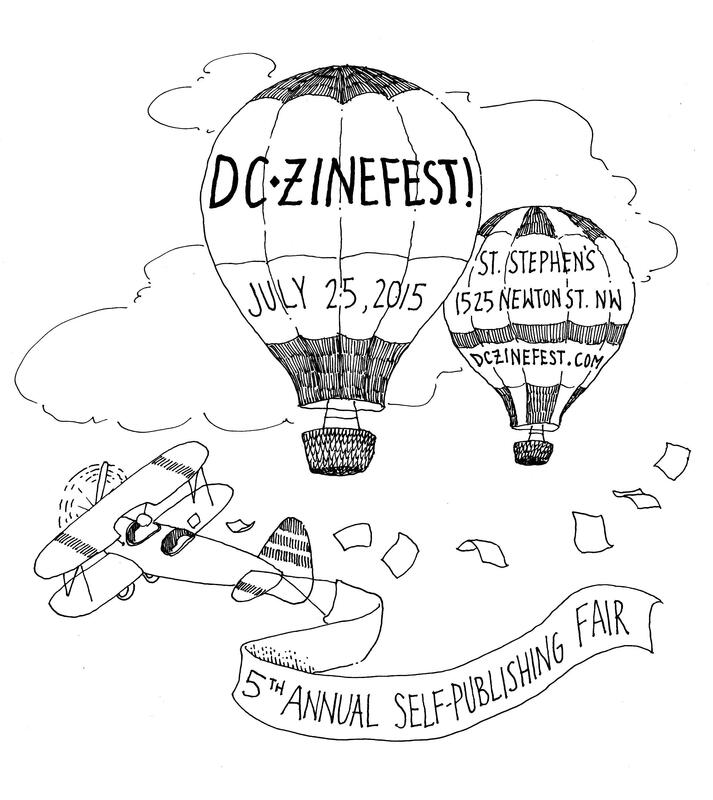 2015 DC Zinefest is July 25th! BIG NEWS: The preliminary list of tablers is LIVE! We’ll be updating as folks get moved up from the waitlist. We’ve had a high number of applicants this year, and new registrants will be added to the waitlist. We’re really excited to see friends old and new. We’re also really stoked about all of our upcoming events! Hope to see many of ya’ll around town as we celebrate our 5th year. Tuesday, July 14th, 6:30p: Zine Night @ the Mt. Pleasant Library! 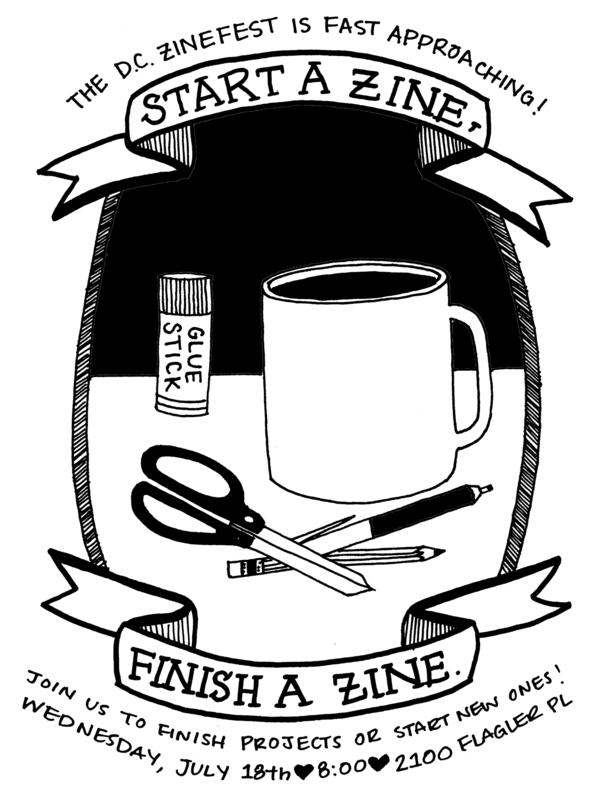 Learn about zines or finish whatever you’re working on in time for the fest! And of course, RSVP for this year’s fest! All mail must be postmarked April 20th. 3. Online registration will open on May 1. While we love art and crafts, we ask that self-published zines make up the majority of things that all tablers sell. Registration is not a guarantee of acceptance–all submissions will be reviewed by our organizers. Finally, please don’t send money now–we’ll contact you about tabling fees after your zines have been accepted. Space is limited, so please register early, and thanks so much–we’d be nothing without you. 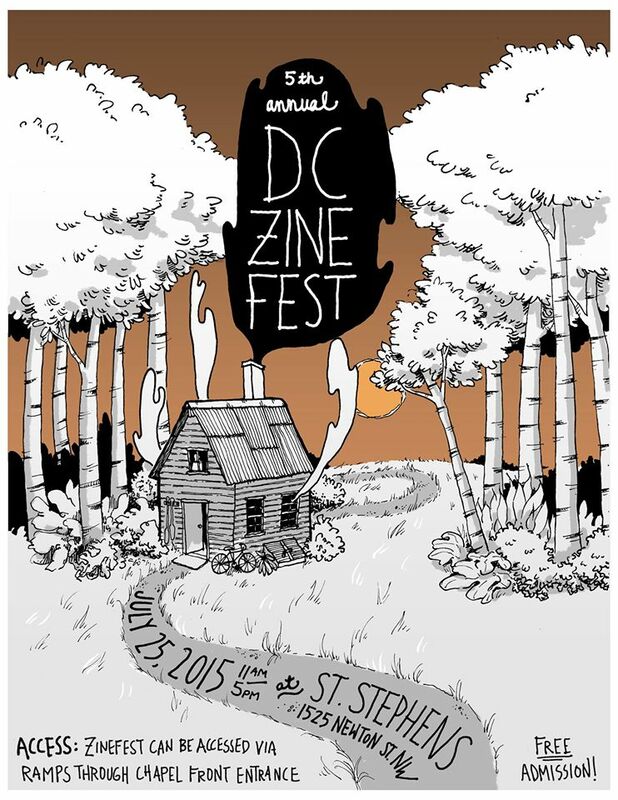 The 5th Annual DC Zinefest is Saturday, July 25, 2015 at St. Stephen’s! Registration info to follow soon- both mail-in and online registration will be during April. DC Zinefest 2015 is July 25th! There’s a new URL for the news portion of your website: http://dczinefest.tumblr.com/ Update your RSS readers, true believers! Our wesbsite will still be located at DC Zinefest.com. Also, don’t forget that registration opens this Wednesday, and we’re having a screening of From the Back of the Room Saturday the 18th! This year, the D.C. Zinefest hopes to benefit, after our costs, two amazing D.C. non-profits that work on community literacy among many amazing aims–Living Wages and Our Place D.C. When you come to the (totally free) Zinefest on Saturday, please consider making a donation, which will go to these amazing organizations. You can also opt to be entered to win some cool zine-related prizes as a thank you. Living Wages of Washington-founded in 1999 by Sister Betsy Hartson, RSCJ, and Robert Crittenden-serves in the poorest and most under-served quadrant of the District of Columbia, its primary work is to provide adult education services for those who have not completed high school. We believe that a lack of a high school diploma almost always means lives of poverty for not only the adult, but also for the next generation, and the next. At two adult education centers, more than 150 adults are able to obtain educational services each year, and about 40 complete the requirements for a high school diploma. All participants improve their reading and writing skills, their computer skills and the job search skills. Some graduates return to volunteer, others to join AmeriCorps to work for one or two years at Living Wages, and still others become community literacy advocates through the Living Wages LEAD (Leadership, Education and Democracy) program. For more than three hundred and fifty adults in the past ten years, Living Wages has meant a high school diploma leading to a better job, additional education and job training and a better life for their children. In the past eleven years at Living Wages, 350 adults have completed their high school studies, received a diploma, and have contributed greatly to the education of their own children. One thousand more have increased their mastery of reading, writing and math. Many others have benefited from enrichment programs, including computer literacy training. Of note is the fact that many graduates return to volunteer or to stay involved in some other way. There are others that enroll in college and then return for help with their studies. Living Wages also serves as the neighborhood copy center, internet cafe and library—all at no charge. On Saturday’s, parents bring their children to use computers needed for school projects, or to do research for their assignments, in many ways, Living Wages centers are truly the literate communities reaching out to the surrounding neighborhoods. Our Place DC provides critical support services to women who are or have been incarcerated. We offer a drop-in center, case management, clothing, help with IDs, housing, employment, and legal services. The Our Voices program of OPDC is a space for women to come together for support and creative expression. Three evening groups combine discussion-based support, therapeutic art & writing groups, and skills-based writing tutoring to promote and support women’s emotional and mental health as well as their ability to express themselves. Each program meets in the evenings at the Our Place DC offices and includes a meal as well as transportation assistance. Financial assistance is greatly needed to provide the food and tokens that make it possible for women to attend these groups. D.C. Zinefest on 20k Under D.C.
Meg and Jenna went and talked about the impending Zinefest on 20k Under D.C., you can listen to it online while you finish your zine. Less than a week to go! Start a Zine/ Finish A Zine! Come hang out with us while we frantically finish zines before the D.C. Zinefest! There will most likely be snacks, tunes, and supportive comradery! Some zine making supplies probably! Also, air conditioning! Perhaps the evening will culminate in an attempt to find a late night copy spot! If you’re not rushing to finish an existing project, you can also come learn how to make a mini-zine or maybe work on a submission to someone else’s zine! ALL THE THINGS! The D.C. Zinefest is only one month away! If you use Facebook, you can RSVP over there for reminders and to help us get some idea of how many people might come! If you’re coming from out of town, whether you’re a tabler or a fan, check out/ post in our ride and housing boards! Pictures from an epic night of Punk Rock Karaoke are up on the DC Zinefest Flickr, you should check them out!